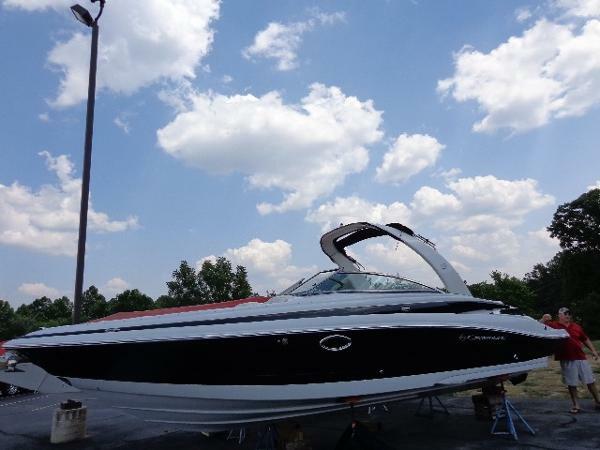 2019 Crownline 285 SS, Standard Features: Mercruiser 6.2 MAG BRAVO III Catalyst 300HP, AFT ELECTRIC SUN LOUNGE SEAT W/DUAL ACTUATOR, HANDHELD TRANSOM SHOWER, FRESHWATER - COLD, HEAD - KMC10 - ENCLOSED W/HAND HELD SHOWER, CABINETRY W/GRANITE COUNTERTOP, PRESSURIZED WATER SYSTEM & ELECTRIC FLUSH TOILET, S/STEEL RUBRAIL W/WHITE EXTRUSION, WINDSHIELD HEADER & LOCK, STEREO: KICKER PREMIUM, IP67 WATERPROOF RATED, FULL COLOR LCD DISPLAY & VARIABLE DIMMER W/DAY & NIGHT MODE, AM/FM WEATHERBAND MULTI-REGIONAL TUNER, USB W/IPOD, IPHONE & ANDROID CHARGE, AUX INPUT, BLUETOOTH, SOCIAL SWIM TRANSOM DESIGN - WITH 8 WET SOUNDS SPEAKERS, STORAGE AREAS W/IMPACT RESISTANT, NON-MARRING COATING, SWIM PLATFORM MAT - GREY, SOFT TOUCH, UNDER MOUNT COCKPIT STORAGE DRAWER, Highlander Carpet, Snap In, Moonrock Dash - Hand Wrapped Shroud w/Double Stitch & Black Diamond Wheel, Raymarine 7' Touchscreen MFD w/Gateway Cable & Engine Information & Sonar, Battery Charger, Bow Flip-Up Arm Rests, Canvas - Bimini Top, Color Matched, Canvas - Bow & Cockpit Cover, Color Matched, Docking Lights (Chrome), Head Door Insert w/Storage Netting, Keychain Remote Control for Courtesy Lights, LED Lighting Package-Cockpit, Stereo Speakers - Extra Two Speakers (Total of 8), Upgraded to Wet Sounds, Table - Side Mount, Portable, Transom Trim Switch, Underwater Transom Lighting, Windlass w/Rope & Chain, Stereo and Kicker Premium Stereo.Additional Features: Mercruiser 6.2 MAG BRAVO III w/DTS Catalyst 350HP, Driftwood Woven Mat, Snap In, Black Dash & Black Racing Wheel w/Black Upholstery Accents @ The Dash, Arch - Moonstone Alum. Arch w/Manual Fold Down, W/Sun-Top and Hang-Tyte Canvas, Fender Clips (4), LED Lighting Pkg - LED Lights on Arch, Stereo -LCD Transom Remote (Req. 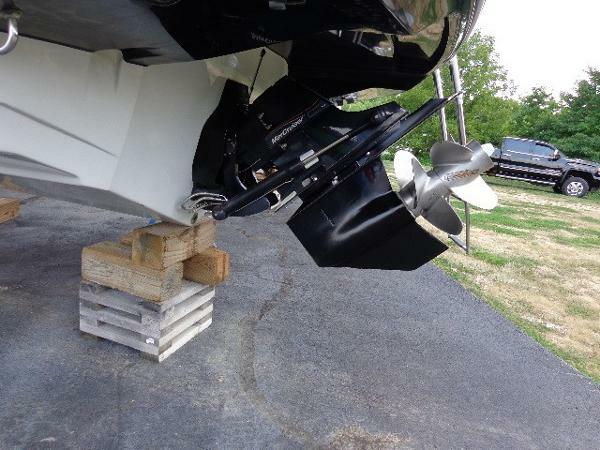 Premium Stereo), Trim Tabs w/Indicators and Platinum Interior. The sleek low profile of the 285 SS paired with its impressive double hull band gelcoat design is bound to make you stand out on the water. The interior of the 285 SS features a high quality, fully upholstered, lavish tri color platinum interior pattern paired with a moonstone vinyl wrapped helm, rich wood grain accents and an executive wood wheel with aluminum spokes. 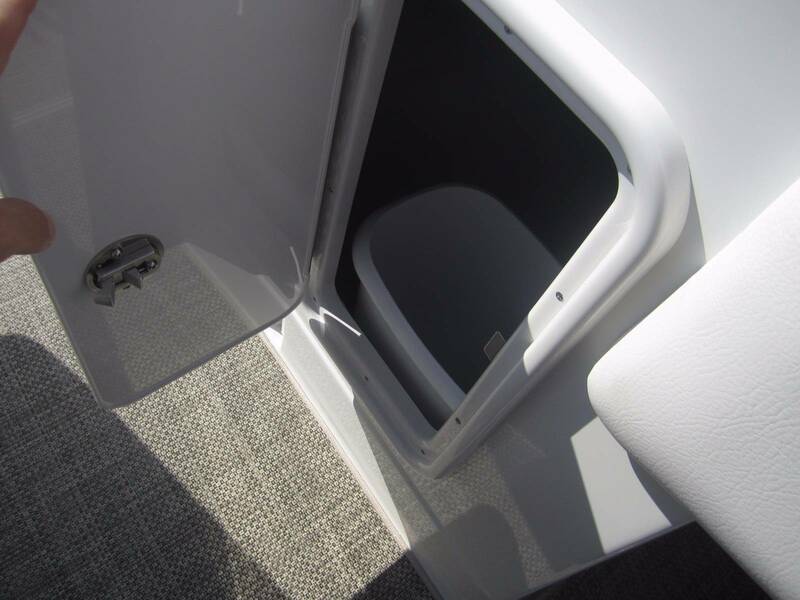 The interior of the 285 SS is further enhanced by stainless steel cup holders, grab handles and hardware. 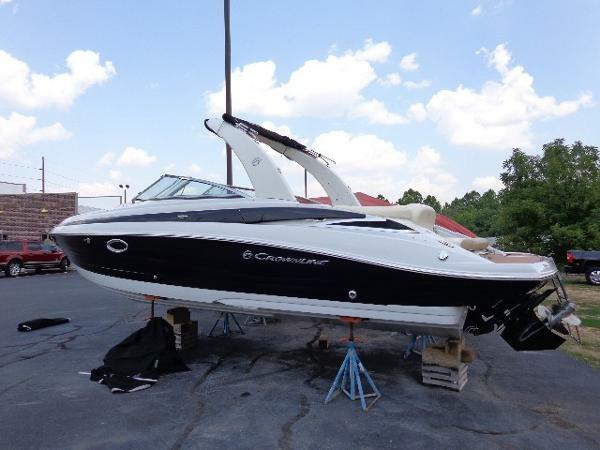 The 285 SS has an abundance of storage for all your gear for a long, fun filled day on the water. 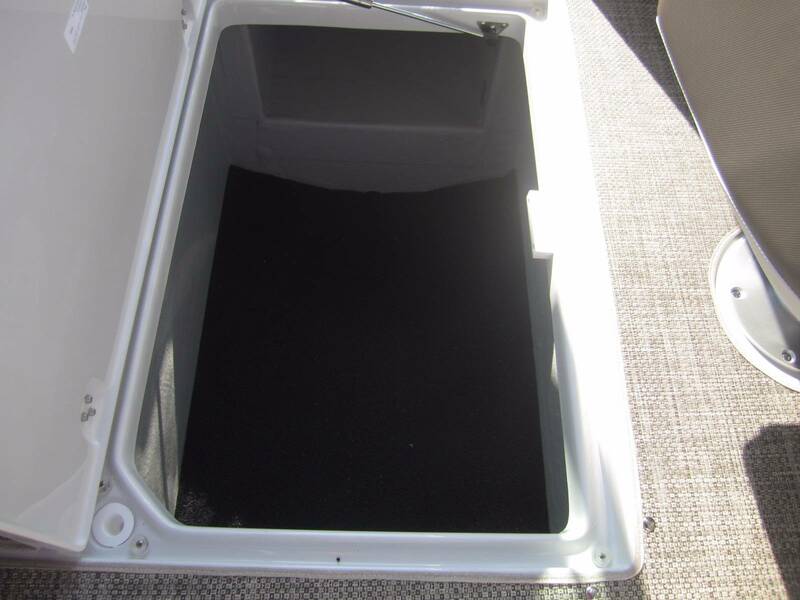 The 285 SS comes equipped with a four step stainless steel boarding ladder to provide stability, a soft touch swim platform mat that extends through the transom walk thru to prevent slips and falls and provide added comfort, a curved, tinted three piece walk thru windshield, clear and easy to read gauges, a depth sounder w/ outside air and water temperature and a fire extinguisher. The 285 SS features a three position aft seat, six marine grade speakers, a battery charger, a 100 plus integrated cockpit cooler, color matched bow, cockpit and bimini canvas, snap in cockpit carpet, an upgraded Sony AM/FM/CD Stereo with a rear USB port and front Aux input, a tilt steering wheel and a full head compartment with an opening Portlight window, rich wood cabinets, solid surface counter, sink, electric flush w/built in macerator and discharge holding tank, pump out head and a pressurized water system.